Cameron Mackintosh’s brand new production of Andrew Lloyd Webber’s The Phantom of the Opera captures the haunting and tragic tale of The Phantom and his love for Christine, which is depicted through incredibly powerful vocals and the relationship between The Phantom, played by John Owen-Jones, and Christine, played by Katie Hall. Along with love interest Raoul, Vicomte de Chagny, played by Simon Bailey. The relationship between The Phantom and Christine is highlighted in the epic descent into and during the scene in The Phantom’s Lair. Owen-Jones portrays a dark and deeply troubled character, in contrast to Christine’s grace and innocence. Owen-Jones and Hall’s operatic vocals are amazingly strong and complement each other perfectly. In amongst the dark tale, the audience is offered some light hearted and comic moments from Monsieur Firmin, played by Andy Hockley, and Monsieur Andre, played by Simon Green, particularly in the manager’s office when they receive all the notes with The Phantom’s demands. Carlotta, played by Angela M Caesar, has outstanding vocals which certainly fulfil the role of the Prima Donna. The set plays a prominent role as it seamlessly transforms from the lavish Paris opera house, to the manager’s office, to the ballet dressing room, to the grand ballroom and, across the misty lake, to the Phantom’s lair concealed within the depths of the opera house. 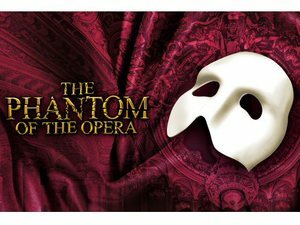 Even twenty-five years on, The Phantom of the Opera remains a true musical legend. Mackintosh’s production dominates the entire auditorium of the Playhouse with The Phantom’s omniscient presence, which keeps the audience enthralled.